This residency program is a post-professional curriculum designed to elevate the clinical skills and knowledge from a general practitioner to that of a clinical specialist in orthopedic physical therapy. Upon completion of the residency program the resident will be prepared to take the Orthopedic Board Certification exam with the American Physical Therapy Association and practice patient-centered, evidence-based orthopedic physical therapy at the competence level of an orthopedic clinical specialist. The mission of the A.T. Still University Orthopedic Physical Therapy Residency Program is to graduate advanced practitioners of orthopedic physical therapy. These graduates will be ready to demonstrate excellence in the clinical practice of orthopedics, participate in continuing education courses and train other practitioners who will provide services to their local and professional community. Residents completing the orthopedic residency will be prepared to take the Orthopedic Clinical Specialist Exam (OCS) given by the American Board of Physical Therapy Specialties. Graduates of the program will represent A.T. 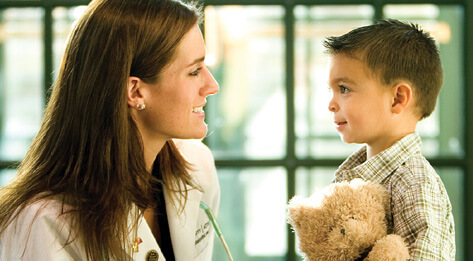 Still University’s values, including devotion to lifelong learning and excellence in education with clinical practice. Resident must be employed in an approved physical therapy clinical setting in Arizona with a wide variety of patients with orthopedic musculoskeletal conditions. Resident must have an APTA orthopedic certified specialist provide 2.5 hours of one-on-one mentoring in patient care per week. 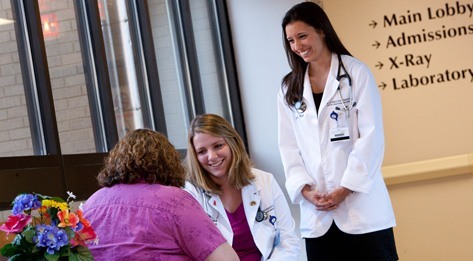 Mentoring for each resident is an organized collaboration between the “site mentor” and core University faculty. Curriculum Overview The curriculum includes online coursework, case studies, weekend continuing education courses and more. A panel of expert clinicians is available to consult with about patient care during the residency program. The resident will also shadow these expert clinicians as part of the clinical education experience. Weekend Courses All weekend courses are open to physical therapists and provide CEU hours. Learn more about our continuing education courses. Review the University Catalog to learn more about the Orthopedic Physical Therapy Residency program. Also read detailed course descriptions and dissertation specifications for the Orthopedic Physical Therapy Residency program and find answers to many of your questions regarding application information and tuition. Approved Annual Residency Opportunities will be on a rolling admissions basis. Once applicant has been offered acceptance into the Residency by the program director they may contact one of the pre-approved facilities below. Applicants may also submit a clinic of their choice as it meets the residency guidelines and requirements for mentorship. For additional information about receiving approval to serve as a clinical site for a resident, please contact the Program Director, Cheri Hodges, at chodges@atsu.edu. Contributing to elevation of the profession and the future of physical therapy. Have completed the Clinical Instructor Education & Credentialing Course sponsored by the APTA. If you have not, there is an opportunity to do so as part of the Residency Program. Elevating the profession of physical therapy through quality continuing education opportunities. Continuing education courses are sponsored by A.T. Still University’s Physical Therapy Department. Individuals can choose to attend any of the courses listed on the PT Continuing Education site and receive CEU hours at the completion of the course. Nationally recognized physical therapists often present at these courses, as detailed below. Some of the courses are specifically sponsored by our Orthopedic Residency and Neurologic Residency. Timothy Fearon received his PT degree from The Ohio State University in 1978. He completed the Musculoskeletal Sequence graduate program at Northwestern University. He completed his Doctorate in Physical Therapy at Northern Arizona University. While doing extensive long term study with the Folsom Physical Therapy group he founded Phoenix Manual Therapy, which initially offered courses, based on the Nordic System of orthopaedic manual therapy. Phoenix Manual Therapy progressed to offering a long-term course frame for study of the Australian approach to orthopedic manual therapy and integration of Norwegian techniques. The course has been running over the last 23 years. He has participated as both a student and instructor through out those years. He earned his Full Fellowship status in the American Academy of Orthopedic Manual Therapy by the challenge process in 1999. He has been specializing in orthopedic manual therapy and spinal rehabilitation for the last 25 years. Dr. Fearon is currently adjunct faculty at A. T. Still University where he teaches manual therapy of the spine and extremities. He has been a guest instructor for NAU, Arizona School of Health Sciences, Langston University, and North Georgia College. He has taught manual therapy courses over the last 15 years, spoken at numerous meetings for the Arizona Physical Therapy Association, and for the APTA. Dr. Young is an associate professor of physical therapy. Dr. Young earned her doctor of physical therapy degree from the University of North Dakota, is a board-certified orthopaedic clinical specialist through the American Physical Therapy Association and is also a fellow of the American Academy of Orthopaedic Manual Physical Therapy. She is currently working towards a PhD through the University of Newcastle where she is researching healthcare utilization and patterns of care in patients with lower extremity injuries. Her primary teaching areas are in the musculoskeletal curriculum and differential diagnosis. She has over 11 years of clinical experience in outpatient orthopedic settings, with a special interest in the spine. She has presented at national conferences in the area of manual therapy and has been published in several different peer-reviewed journals. She joined the ATSU faculty in 2016. Integration of manual therapy with total joint replacements. Personal malpractice liability coverage required upon acceptance, prior to matriculation. Submit primary application through RF-PTCAS at https://rfptcas.liaisoncas.com. Application opens Oct. 1, one year prior to anticipated enrollment. The deadline to apply through RF-PTCAS is March 15th of the year of anticipated enrollment. Interview with Residency Program Director or faculty. **Program does not require additional Evaluations aside from those included in the RF-PTCAS primary application. Tuition for the 2019-2020 twelve-month residency program is $8,496. This $8,496 can be paid in four installment payments (First payment includes a one-time fee of $50). This tuition does not include the costs of book or other supplies, but does include the costs of weekend courses. Tuition is subject to change based on action by the Board of Trustees of the University. *Tuition discounts may be available to A.T. Still University alum. How is A.T. Still University’s Orthopedic Residency Program unique from other residency programs? The A.T. Still Orthopedic Residency is a multi-site program with strong clinical affiliations in Arizona. Our program has experienced faculty, both as educators and as clinical specialists. In addition to the core ATSU faculty, we have partnered with expert clinicians in a variety of clinical specialties who have a wealth of knowledge and clinical experience, which serves as a unique opportunity for our residents. As part of our curriculum, we sponsor several weekend courses with nationally recognized speakers that integrate didactic concepts and the development of new skills that can be immediately applied in the clinic. 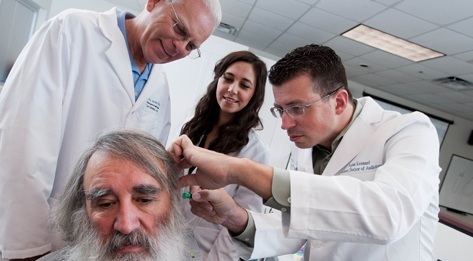 Our curriculum is also unique in that we include extensive training in dry needling techniques. 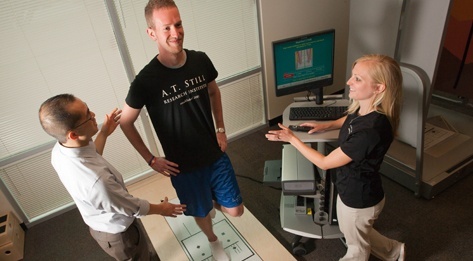 Our Residency Program is built on a foundation of strong clinical reasoning in physical therapy practice. Our residency curriculum includes a focus on clinical reasoning in practice, education, and evidence-based practice. 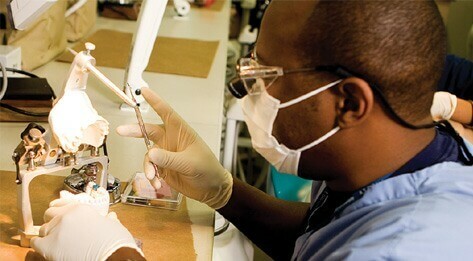 The Program’s University setting also provides tremendous resources to the resident, including the A.T. Still Memorial Library with a magnitude of online resources, support staff, equipment, and excellent lab facilities, which are designed to promote an optimal learning experience. Supervised clinical mentorship and clinical reasoning skill are key components of A.T. Still University’s Orthopedic Residency Program. Each week will include a minimum of 2.5 hours with their clinical mentor working with the resident’s patients. In addition, core faculty from A.T. Still University also provide mentorship in clinical practice. The didactic component of the residency curriculum is centered on the “Current Concept of Orthopedic Physical Therapy,” a course with 12 monographs published by the orthopedic section of the APTA. There are assigned learning activities to include educational program development. The resident has the opportunity to be a clinical instructor for an entry-level DPT student as part of the 12-month program. Weekly webinars are held where the residents and core faculty have discussions and share case studies. The Program has 7 clinical experts for consultation and shadowing in clinical practice. There are multiple weekend courses with nationally recognized speakers, in addition to lab sessions to develop and practice clinical skills. 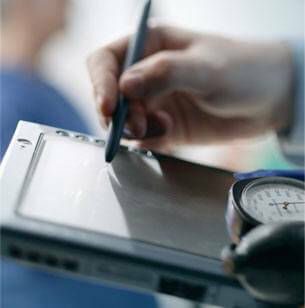 There are two written and two live patient exams for assessment of clinical skills and theoretical knowledge. How many years of clinical experience in the Physical Therapy profession should I have before applying to the Orthopedic Residency Program? There is no minimum experience requirement to apply to the Program. 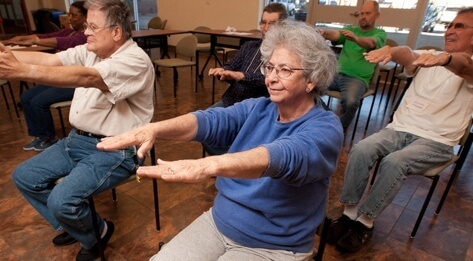 We are able to tailor our Program to address the needs and experience level of each individual resident. We welcome and encourage new graduates to apply to the Program. When is the application deadline and Program start date? Completed applications are due to ATSU through RF-PTCAS by March 15th of each year. Following the application review including an interview, applicants will be notified of acceptance decisions by April 15th. The 12-month Program will start the first Monday of October every year. The applicant may apply before having secured an approved clinical site and mentor. Applicants must have a license to practice physical therapy in Arizona by the Program start date, and have employment secured in a pre-approved clinical site with a pre-approved clinical mentor. The director of the Residency Program must approve these requirements before matriculation. How do I secure employment in a pre-approved clinical site with a mentor? Our residency website includes a list of pre-approved clinical sites with mentors. Once applicants have been accepted into the residency program, the program director will contact the pre-approved clinical sites providing them with the accepted resident’s application information. The resident applicant can also propose a clinical site with a mentor in Arizona for the program director to consider as a potential site for the residency program. How much time should I expect to work on the residency each week? We estimate an average of 10 hours per week in addition to employment responsibilities should be directed toward the Residency Program. How many hours of clinical practice per week and what are the benefits of employment? Residents are required to be employed in a non-physician owned clinic in Arizona that has a wide variety of a patient population with musculoskeletal conditions. We recommend the resident works approximately 40-hours per week. The details of hours of patient care, salary, and benefits, are negotiated between the resident and the employer. Who will be my mentor and what are the requirements of the mentor? Clinical mentors will provide mentorship to the resident one-on-one for 2.5 hours in the clinical environment the resident practices each week. It is preferred the mentor hold a certification as an orthopedic specialist however; the minimum requirement for the mentor is 3-years of clinical practice in orthopedics. The clinical mentor must be pre-approved by the program director. The core faculty at ATSU will also provide mentorship to the resident in the clinic throughout the program. What are some of the benefits to the mentors? The mentors are given the title and privileges of Adjunct Faculty of A.T. Still University. This includes access to the extensive resources of the university’s library and online services. The clinical mentor will have the opportunity to participate in the Clinical Instructor Education and Credentialing course sponsored by the APTA as part of the resident program. The mentors are also encouraged to participate in all weekend courses (no registration fee), and to participate in the webinars and other learning. 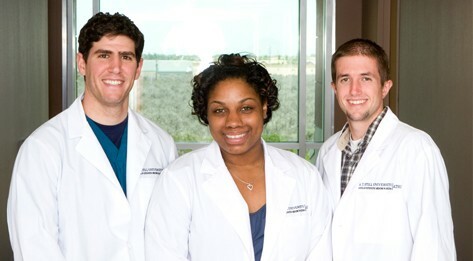 How many residents participate in the Orthopedic Residency Program? Four to seven residents are accepted into the Program each year. What license should I hold to apply to the Orthopedic Residency Program? The applicant must have an Arizona license to practice Physical Therapy at the time of matriculation. Can student loans be deferred while enrolled in the Program? Residency Programs may qualify for deferment of student loans while enrolled in the Program. However, individual lenders have different requirements. Please check with lender to confirm this information for your specific situation. Yes, in person or video-conference interview via Zoom is required. Have additional questions? Contact Cheri Hodges, PT, DPT, OCS, FAAOMPT, program director Chodges@atsu.edu or call 480.219.6189. The curriculum delivery is blended with online resources, directed learning activities, clinical mentoring, and laboratory practical course work. The program has been developed to accommodate the full time working individual who is currently seeing patients in an out patient clinical setting. The program is 12 months in duration, and will be delivered in eight learning modules. Each module will include content from the “Orthopedic Physical Therapy Description of Specialty Practice” on examination, evaluation, diagnosis, prognosis, intervention, and treatment outcomes for common musculoskeletal conditions. Developing patient centered evidence-based practice will be the focus of each module. This course will provide the fundamental bases for the courses to follow. The primary goal of the course will be to develop an understanding of the clinical reasoning and clinical decision-making process and foster the resident’s development of these skills. The clinical reasoning process in this course and all succeeding courses includes meta-cognitive analysis of both clinical success and error in patient management. Models of clinical reasoning will be explored and emphasis will be placed on the International Classification of Functioning, Disability and Health and the developing evidence-based practice guidelines developed by the orthopedic section of the American Physical Therapy Association. Residents will be required to develop and present case studies demonstrating their developing clinical reasoning skills and understanding of evolving of evidence in practice management of common musculoskeletal conditions. This course will provide an in depth review of current practice management concepts with patients with functional impairments in the cervical and thoracic spinal regions. Evidence based orthopedic physical therapy theory and practice will be developed through clinical and laboratory experiences. Clinical reasoning skills will continue to be developed applying clinical reasoning and evidence based practice principles in these body regions. A strong emphasis will be placed on applying new theoretic knowledge and clinical skills to direct patient care in the clinic throughout each module. This course will provide an in depth review of current practice management concepts with patients with functional impairments in the shoulder region. Evidence based orthopedic physical therapy theory and practice will be developed through clinical and laboratory experiences. Clinical reasoning skills will continue to be developed applying clinical reasoning and evidence based practice principles in these body regions. A strong emphasis will be placed on applying new theoretic knowledge and clinical skills to direct patient care in the clinic throughout each module. This course will provide an in depth review of current practice management concepts with patients with functional impairments in the elbow wrist, and hand regions. Evidence based orthopedic physical therapy theory and practice will be developed through clinical and laboratory experiences. Clinical reasoning skills will continue to be developed applying clinical reasoning and evidence based practice principles in these body regions. A strong emphasis will be placed on applying new theoretic knowledge and clinical skills to direct patient care in the clinic throughout each module. This course will provide an in depth review of current practice management concepts with patients with functional impairments in the lumbo-pelvic region. Evidence based orthopedic physical therapy theory and practice will be developed through clinical and laboratory experiences. Clinical reasoning skills will continue to be developed applying clinical reasoning and evidence based practice principles in these body regions. A strong emphasis will be placed on applying new theoretic knowledge and clinical skills to direct patient care in the clinic throughout each module. This course will provide an in depth review of current practice management concepts with patients with functional impairments in the hip region. Evidence based orthopedic physical therapy theory and practice will be developed through clinical and laboratory experiences. Clinical reasoning skills will continue to be developed applying clinical reasoning and evidence based practice principles in these body regions. A strong emphasis will be placed on applying new theoretic knowledge and clinical skills to direct patient care in the clinic throughout each module. This course will provide an in depth review of current practice management concepts with patients with functional impairments in the knee region. Evidence based orthopedic physical therapy theory and practice will be developed through clinical and laboratory experiences. Clinical reasoning skills will continue to be developed applying clinical reasoning and evidence based practice principles in these body regions. A strong emphasis will be placed on applying new theoretic knowledge and clinical skills to direct patient care in the clinic throughout each module. This course will provide an in depth review of current practice management concepts with patients with functional impairments in the foot and ankle regions. Evidence based orthopedic physical therapy theory and practice will be developed through clinical and laboratory experiences. Clinical reasoning skills will continue to be developed applying clinical reasoning and evidence based practice principles in these body regions. A strong emphasis will be placed on applying new theoretic knowledge and clinical skills to direct patient care in the clinic throughout each module. This course prepares the resident to become a clinical instructor for an entry-level physical therapy student. The course covers how to develop learning experiences for the students, and how to facilitate ongoing learning experiences through questioning and effective feedback from the resident. Management skills for students in exceptional situations will be addressed, as well as legal implications for the clinical instructor, and legislation presented in the American Disabilities Act. This course is designed to present the basic concepts of diagnostic imaging as related to physical therapy practice. This course includes an overview of physical principles, diagnostic capabilities, and key points for patient education. Application to physical therapy and treatment strategies will be covered. 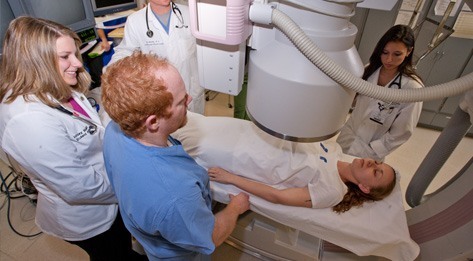 Major diagnostic imaging procedures commonly experienced by patients with physical therapy-related diagnoses will be addressed; including radiographs, ultrasound, magnetic resonance imaging, computerized tomography, positron emission tomograghy, single photon emission computerized tomography, fluoroscopy, and myelogram. The purpose of this course is to introduce the resident to the concepts and principles necessary to understand the capabilities and applications of various diagnostic imaging and the impact on physical therapy practice. Expectations are not for the resident to be proficient in reading all imaging studies, but to have a basic knowledge of their use and purpose. The should come to respect the role that the diagnostic imaging studies play in the practice of physical therapy and how these studies can augment clinical evaluation and patient/client management interventions.